Dozens of villagers in northern Lantau chopped down a mangrove near an ecologically sensitive bay yesterday to protest against a government move to zone areas on the fringes of their villages as protected land. Excavators were brought in to raze trees, while machete- and hoe-wielding villagers chopped down shrubs on the coast of Tai Ho Wan, which is known for its oyster-rich mudflats and horseshoe crabs. Together with the three rivers that feed it, Tai Ho Wan is now designated as a Site of Special Scientific Interest (SSSI), but not yet zoned as such. Statutory planning rules would ensure government departments give due consideration to conservation if the proposal was approved later this year. But indigenous villagers of the San Heung community, which includes Pak Mong, Ngau Kwu Long and Tai Ho villages, fear their rights to farm and build small houses will be restricted if the restrictive development plans are agreed to. “Step by step, the government has been depriving us land owners of our rightful use of land, which was originally designated for agricultural use,” the community said in a declaration in which they also demanded to meet the development and environment ministers. They blamed construction of the North Lantau Highway in the 1990s for blocking discharge from the river and flooding coastal farmland. The indigenous villagers said in their declaration that the government had “bullied” them again in 1999 with the SSSI designation. Heung Yee Kuk vice-chairman Daniel Lam Wai-keung showed up to support the villagers’ protest yesterday. Tse said most of the private land in the enclave had been sold to developers in the 1990s. “It is worth questioning whether they’re really doing this for the right to build small houses,” he said. Under an interim development plan covering 230 hectares, gazetted in March, the villages’ development zones are limited to 1.27 hectares, which the villagers say constrains their right to build small houses. I refer to the report (“Tai Po beach clears court hurdle ”, August 13). Why does the government rush ahead with this project when water quality in existing beaches is deteriorating? I refer specifically to Hoi Ha Wan. I have been swimming there regularly since 2006 and the water has always been crystal clear. Since 2014, its shallow waters have turned markedly murky and foamy. Most of the farmland in Pak Sha O village, adjacent to a stream that feeds into Hoi Ha Wan, has been bought by developers. The Lands Department is more agreeable to approving village house applications on cultivated farmland. Therefore, land at Pak Sha O is being farmed for vegetables. I suspect there is massive use of chemical fertilisers and pesticides, which is now finding its way to Hoi Ha Wan via the stream. This may have caused a rapid deterioration of seawater quality. A high standard of water quality in Hoi Ha Wan must be maintained for at least two reasons. First, about 100,000 people use it and its beaches for recreation annually. The government should have the health of these people at heart. Second, the biggest and prettiest coral colonies in Hong Kong are found there and the surrounding seas. This is one of Hong Kong’s irreplaceable treasures. Corals are extremely sensitive to chemicals. Adding more toxic chemicals and waste products to Hoi Ha Wan waters will impact on marine life negatively. The Agriculture, Fisheries and Conservation Department declined to have the near-shore water quality checked, because it has subcontracted the work of monitoring Hoi Ha Wan water quality, until March 2015, to a third party. The department should have located the monitoring station closer to shore and corals where it matters, but it was located one kilometre away. The future looks dire for Hoi Ha Wan and Hoi Ha Wan Marine Park. Recent outline zoning plans show more village houses will be located close to streams and shoreline. These locations are much sought after by developers for their scenic value. Without central sewage treatment, chemicals and grey water from new houses will reach Hoi Ha Wan. In time, it could be renamed Hoi Ha sewage pit. Village house development is lucrative. This creates pressure on government departments to “facilitate” by bending their own rules. We must remain vigilant to protect our country and marine parks. In the midst of environmental hearings on a proposed third runway, conservation authorities have made a surprise pledge to designate two new marine parks off Lantau Island by 2017. The announcement was made as government advisers continued deliberation on the Airport Authority’s environmental report on the proposed additional runway at Chek Lap Kok. The Agriculture, Fisheries and Conservation Department said the announcement, which ends a 12-year impasse, was not related to the runway proposal. It said it was a response to public concern and part of its own Chinese white dolphin conservation programme. The proposed parks will cover 660 hectares off southwest Lantau and 1,270 hectares around the Soko Islands archipelago, in a bid to enhance protection for the endangered dolphin and finless porpoise. But Dolphin Conservation Society chairman Dr Samuel Hung Ka-yiu suspected the move was made by the government to take pressure off the authority. “The authority’s [report] and the long-delayed designation of the two marine parks cannot be grouped together. “We never said this could be a compensation measure for the third runway and it cannot be one. Marine parks cannot mitigate the [650 hectares of] habitat loss,” he said. He urged subcommittee members of the Advisory Council on the Environment, who will meet today, not to accept the new plans as justification for the airport expansion. An authority spokesman said the government’s latest park plan was not part of its report but it would “complement” its own conservation measures to protect the dolphin population. “We will launch another round of public engagement in 2015 and take other necessary steps and seek to complete the statutory procedure for the designation by early 2017,” a department spokesman said. Proposals to designate the two marine parks span back to 2002 but never came to fruition due to opposition from the fisheries sector and Lantau residents. Dr Michael Lau Wai-neng, a senior programme head at WWF Hong Kong, said the move was welcome, but was not enough. “There is a consensus among scientists that [dolphin] habitat can only be protected by linking up the parks along the Tai O fringe, to the existing Sha Chau and Lung Kwu Chau Marine Park,” he said. The authority’s proposal for a 2,400 hectare marine park connecting Sha Chau and another proposed park northeast of Lantau has been dismissed as ineffectual as it would be designated only after the runway’s completion in 2023. Lawmaker Steven Ho Chun-yin, of the agriculture and fisheries sector, said the industry would likely oppose the park plan if it hurt fishermen’s livelihoods. He said that on issue would be whether fishing permits for the marine parks would be allowed to be transferable. “The government will have to consult the industry further,” Ho said. The Country and Marine Parks Board will be consulted on the draft maps at a “suitable time” before it is published for public inspection, the department said. Plans to designate southwest Lantau and the Soko Islands as marine parks were announced yesterday, 12 years after they were first gazetted. The marine parks will be part of efforts to protect important habitats of Chinese white dolphins and finless porpoises. The Agriculture, Fisheries and Conservation Department is hoping to complete the statutory procedures for the parks by early 2017. Plans were first gazetted in 2002. Southwest Lantau and the Soko Islands are major habitats of these mammals. 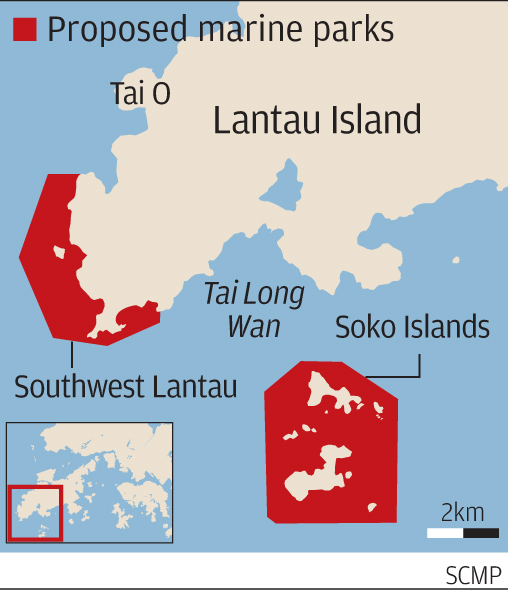 The conservation areas will cover about 660 hectares of water off Lantau and 1,270 hectares of water off the Sokos. Government advisers on Monday were highly sceptical of the Airport Authority’s assessment of the environmental impact of the proposed third runway at the airport, with one expert consultant’s predictions about a new marine park questioned. But the authority said they were “confident” the environmental advisers would eventually give a green light to the project. The remarks came on the first of three days of meetings being held by the Advisory Council on the Environment, which will offer its view to the government on whether measures outlined by the Airport Authority for offsetting the environmental impact of a third runway are sufficient. The authority has proposed designating a nearby site as a marine park in 2023 after the runway is built. It’s consultant, marine biologist Dr Thomas Jefferson, said numbers of Chinese white dolphins living in the north Lantau area would drop during construction but rebound later when the marine park is designated. “Dolphins are very complex animals … they have the ability to move around,” Jefferson had said in June. Council member Dr Hung Wing-tat said the authority needed to present data showing how many Chinese white dolphins would return to the area once the proposed 2,400 hectare marine park – connecting the existing Sha Chau and Lung Kwu Chau Marine Park with a planned Brothers Islands marine park – is designated. “You speak of creating a fairy tale … a paradise … How can you make sure that in seven years time [in 2023] there will be peace in that area for the dolphins? How can you ensure that there won’t be any other disturbing activities?” he asked. Jefferson had based his prediction in part on the experience of dolphins returning to the area after the initial construction of the airport at Chek Lap Kok. This was dismissed by council member Dr Gary Ades as “comparing a grape with an apple”. But Peter Lee, the authority’s general manager for environmental projects, said he was confident the council would eventually give them the green light. The authority on Monday revealed four additional measures to mitigate the impacts of the project on the dolphins, including a cap on the number of high-speed ferries from the SkyPier at its current level of 99 per day and conducting night studies on dolphin activity. A coalition of green groups including the Hong Kong Dolphin Conservation Society, Greenpeace, WWF-Hong Kong and Friends of the Earth protested next to the venue of the meeting. They urged the council not to rubber stamp the authority’s mitigation proposals and to reject them. WWF-HK assistant conservation manager Samantha Lee Klaus said the authority was adopting a “destroy first, conserve later” approach. Prospects for a proposed third runway at Hong Kong International Airport seemed uncertain yesterday as environment advisers delayed their decision on whether to approve its environmental impact assessment study. The advisers – from a subcommittee under the Advisory Council on the Environment – were concerned about how adequate and effective measures to mitigate the project’s impact on the threatened Chinese white dolphin habitat would be. If the study is approved and the HK$130 billion project is given the go-ahead, some 650 hectares of prime habitat for the shrinking dolphin population would be lost to land reclamation for the third runway. Construction would last from 2016 to 2023. The Airport Authority will respond in writing to further queries from the subcommittee, before another meeting on Monday for the advisers to deliberate their decision. The subcommittee, which has spent 15 hours in three days grilling the authority’s officials on the environmental impact assessment study, met yesterday afternoon to discuss whether to recommend the advisory council to endorse the report. But by the end of the meeting, it had still not drawn a conclusion on the city’s single most costly infrastructure project. The council has to submit its views by late next month to the environmental protection director, who will then decide whether to issue a work permit for the project. A subcommittee member, who wanted to remain anonymous, said members at the meeting “freely expressed their opinions” about the report and what outstanding issues had to be further addressed by the authority. Another member said the subcommittee had a number of doubts on the mitigation measures to protect the dolphins during construction and what could be done to draw them back after the work is done. The authority’s replies had been unconvincing, he said. The authority has so far agreed to set up a 2,400 hectare marine park to compensate for the habitat loss, but will build the park only after the runway is completed in 2023. It also promised to re-route its Skypier high-speed ferry services and lower the ferries’ speeds during construction, but rejected suggestions to relocate the pier from the east to the west side of the airport. The authority’s other mitigating measures include adopting a non-dredging reclamation method to reduce underwater noise that would affect the dolphins, and to set up an eco-enhancement fund to support dolphin research. The subcommittee member said the group was also concerned about the authority’s role as a proponent of the large-scale project that would involve various government departments. “The authority can’t speak for the government, and this leads to the question: to what extent does it have the power to do what it has pledged to do,” he said. Samuel Hung Ka-yiu, a dolphin expert who has been opposing the runway project, said he was pessimistic that the subcommittee would reject the controversial project. “The government’s hands are everywhere and officials will make sure that the project is passed,” he said.